Dear @SouthwestAir — I know I’m fat, but was Captain Leysath really justified in throwing me off a flight for which I was already seated? @ThatKevinSmith hey Kevin! I’m so sorry for your experience tonight! Hopefully we can make things right, please follow so we may [Direct Message]! In the days since, there have been numerous tweets and re-tweets as well as coverage both from blogs and traditional media. Smith has addressed it on his own blog and podcast, and Southwest has issued two statements via its corporate blog (1, 2). The incident has re-opened the conversation about weight and size restrictions on airplanes, including Southwest’s own “Customer of Size” policy, which has existed for 25 years, according to the airline. In this particular case […] there are two brands involved. They both have their own objectives for being vocal about the situation at hand, and they both have their own kind of power in influencing the public. The use of social media for both of these brands continues to demonstrate their influence over something that may have affected Southwest less seriously a few years ago. Social media has indeed changed the public relations landscape. Because complaints are more visible, companies now find themselves handling customer service issues publicly. It’s also important to handle those issues quickly before they blow up even bigger. If the company is actively using social media […] the consumer stands a great chance of hearing directly from the company and being engaged and having their issues resolved. If someone feels they are not being heard, social media is a very visible way to tell your friends, the people that follow you, that you’re not happy and hopefully the company will be paying attention. You’ll find the tale is not about my raging, ravenous celebrity ego; it’s about an airline that continues to dig a PR nightmare hole with every minute that goes by sans phone call or meaningful apology (as many have pointed out, that blog was more insult than apology, as they merely used that statement to maintain their position: “See, we made no real error because we’ve got this F*ck-the-Fatties policy…”). The whole situation also drives home the point that some of the more popular and influential social media users may not be someone who is easily recognized in person. Smith has challenged Southwest to bring a row of seats to The Daily Show so he can prove he can fit in the seat and buckle the safety belt, with a $10,000 charity donation on the line. 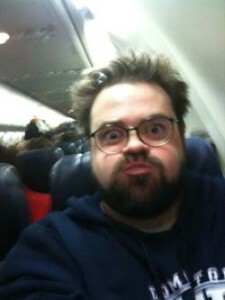 Image of Kevin Smith on Southwest Airlines plane by Kevin Smith via Twitpic.